Ted Chippington that is. I am on record as being a great admirer of Ted Chippington. For those of you not in the know, Ted was the greatest stand-up comic of the '80s. "I was walking down the road the other day, this chap drove up beside me and said, 'Excuse me, mate, I'm in a dilemma.' I said, 'Aye, good motors, Dilemmas. I was thinking of buying one myself. A red one perhaps.'" "I was walking down the road the other day, this chap walked up to me and said 'Do you want to buy some grass, mate?' I said 'No thanks, mate, I've got crazy paving. Haven't got a garden, you see.'" "I was walking down the road the other day, this chap walked up to me and said 'Do you want to buy some LSD, mate?' I said 'No thanks, mate, We've gone decimalised now. You know, pounds, shillings and pence - no use to me any more.'" "I was walking down the road the other day, this chap came up to me. I said to him, 'Haven't seen you for a while.' He said 'Well, I've just got back from Nam.' I said, 'What, you mean Vietnam?' He said 'No, mate, Chelt'nam.'" "I look forward to when I've got a car and I can drive down the road, so I won't get all these characters coming up to me." Ted has been revived, found religion and is now the Rev. Ted. 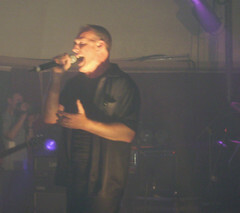 There are plans to release a box set of his complete works in 2007. He has a MySpace. He is currently doing a few tour dates but none anywhere near me unfortunately. If you get the chance please go and see him. You won't regret it. Here is a rather untypical example of Ted at work. This is a collaboration with label-mates Fuzzbox and The Nightingales on Ted's song Rocking with Rita. Head to toe. Rocking with Rita would certainly be in my all time top ten favourites. I've got it on a well worn tape so I look forward to the box set. Glad to see he's touring again. "I was walking down the road the other day -"
"No, you're wrong. You think you've heard it, but this isn't the one you're thinking of. I was walking down the road the other day..."